Excellent phone. Very slim that&apos;s why nicely handle. Good screen . Excellent phone with most features that you can find today. *Processor is probably not the latest one available in the market, but for normal usage and the apps of today doesn&apos;t need anything more. * For this cost, and latest features, 128 GB should have been offered. It could have been a game changer. Great phone, worth spending that much amount. Outperformed by the other at the same price. I pre-ordered this device and have been using it since then. 1. Fingerprint scanner is an active scanner means you do not have to press any button before scanning your fingerprint. 2. 6" display with 368 ppi produces excellent contrast and inky blacks, display is also legitimately bright for an AMOLED display. You should have no issue using this phone even in bright sunlight. Color reproduction and viewing angles are great too. 3. Snapdragon 653 processor coupled with 6GB RAM and 64 GB storage. In daily scenarios phone breezes through all tasks threw at it. Let it be gaming or opening multiple apps. There are no heating issues with this device. RAM management is also top notch. 1. The device is too big for one hand usage and people with small hands will definitely have to juggle the phone everyday. 2. Fingerprint is not as fast as its competitors. 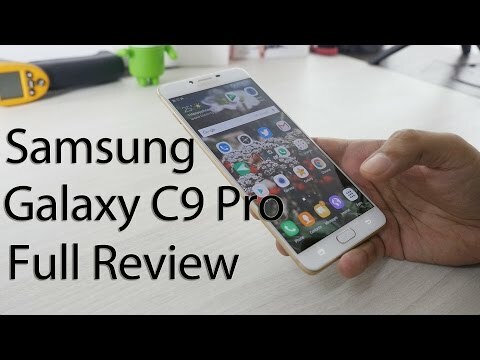 29 Pricebaba users have written their experience with Samsung Galaxy C9 Pro. If you own Samsung Galaxy C9 Pro, please do leave your feedback too. Lowest price of Samsung Galaxy C9 Pro price in India starts at Rs. 24,500 Samsung Galaxy C9 Pro is available on Amazon at Rs. 24,500. Prices updated on 21st April 2019. Earlier this year, Samsung pulled the wraps off the Galaxy C9 Pro. It is sort of a phablet device with a massive 6-inch Full HD screen with 1920 x 1080 pixels resolution and 2.5D curved glass. People normally expect at least a Quad HD screen with the display of this size, though. Moving on, the Galaxy C9 Pro flaunts a minimalist design with metal unibody, featuring two antenna bands on the rear. The top has a secondary noise-cancellation microphone whereas the bottom includes a single speaker grill, primary microphone, USB Type-C port as well as a 3.5mm audio jack. The right side embraces a SIM card and memory card tray. On the other hand, the left side has a volume rocker and a power button. Samsung got itself into the 6GB RAM segment with this phone, something where the company had never ventured before. The device runs Qualcomm's Snapdragon 653 SoC, which is an octa-core processor. You must have figured out by now that the Galaxy C9 Pro comes packed with specifications which ensures a smooth performance. Furthermore, it runs Android 6.0 Marshmallow operating system. The Samsung Galaxy C9 Pro packs a massive 4000mAh battery with connectivity options like 4G VoLTE, Bluetooth 4.0, dual band Wi-Fi, and NFC. It is the treat for selfie lovers since it features a whopping 16MP secondary camera up front. It also houses a 16MP rear camera with dual-tone LED flash and f/1.9 aperture. Talking about the box content, Samsung also bundles a charger with support for fast charging. You will also get a USB Type-C to microUSB adapter, similar to the Samsung Galaxy Note 7. That aside, the company also offers the standard in-ear earphones. Ans: Yes, Samsung Galaxy C9 Pro supports VoLTE out of the box and should work well with Jio network. Ans: Samsung Galaxy C9 Pro uses the USB Type-C port for data syncing and charging. Ans: Yes Samsung phones usually get gradual Android updates and the C9 Pro shall be no exception. Ans: It has a 16MP front camera and thus, the C9 Pro can click quite decent selfies. Ans: No, the 4000mAh battery in the Galaxy C9 Pro is not user removable. 8. How much time does Samsung Galaxy C9 Pro take to charge?